Brian Meeks, Senior CAD Tech. At Germaine Surveying, Inc. we pride ourselves on being a hometown business that provides quality work, graphic details and small town friendly service to all of our customers throughout Florida. Our office is located in Sebring, located in central Florida. 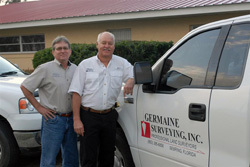 Founded in 1982, Germaine Surveying has been in business for over 33 years. We have grown rapidly from a one man operation to over 20 permanent staff which includes our highly competent field surveyors and office technicians. Our technicians perform their tasks with the most up to date and advanced technology available to give our customers the best graphic details and quality work possible. Copyright © 2007-2015 by Germaine Surveying, Inc. All Rights Reserved.